In Spain we have a saying "Hecha la ley, hecha la trampa" which basically means there will always be a way to circumvent a restriction. In fact, that is pretty much what hacking is all about. It seems the idea of 'counterfeiting' appeared at the same time as legitimate money. The Wikipedia page for Counterfeit money is a fascinating read that helps explain its effects. 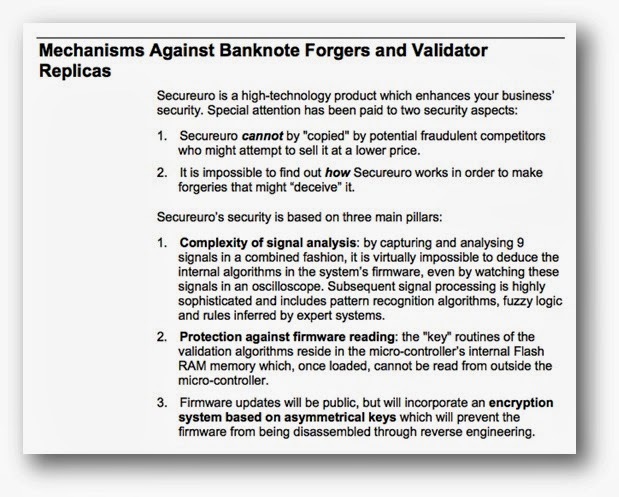 Nowadays every physical currency implements security measures to prevent counterfeiting. Some counterfeits can be detected with a naked eye, while others need specific devices or procedures to be identified. 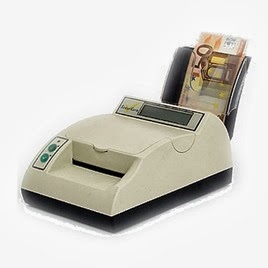 In order to help employees, counterfeit money detectors can be found in places that accept cash, including shops, malls, postal offices, banks, and gas stations. Recently I took a look at one of these devices, Secureuro. 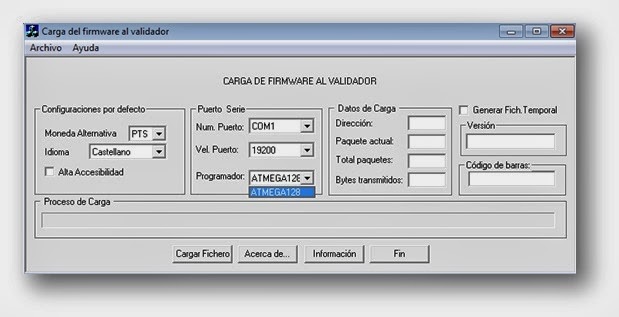 I chose this device because it is widely used in Spain, and its firmware is freely available to download. As usual, the first thing I did when approaching a static analysis of a device of this kind was to collect as much information as possible. We should look for anything that could help us to understand how the target works at all levels. I found some videos where the vendor details how to use the device. This let me analyze the behavior of the device, such as when an LED turns on, when a sound plays, and what messages are displayed. This knowledge is very helpful for understanding the underlying logic when analyzing the assembler later on. Technical specs, manuals, software, firmware ...    See references. Unfortunately, some of these claims are not completely true and others are simply false. It is possible to understand how Secureuro works; we can access the firmware and EEPROM without even needing hardware hacking. Also, there is no encryption system protecting the firmware. Before we start discussing the technical details, I would like to clarify that we are not disclosing any trick that could help criminals to bypass the device 'as is'. My intention is not to forge a banknote that could pass as legitimate, that is a criminal offense. My sole purpose is to explain how I identified the code behind the validation in order to create 'trojanized' firmware that accepts even a simple piece of paper as a valid currency. We are not exploiting a vulnerability in the device, just a design feature. This is the software that downloads the firmware into the device. The firmware file I downloaded from the vendor's website contains 128K of data that will be flashed to the ATMEGA128 microcontroller. So I can directly load it into IDA, although I do not have access to the EEPROM yet. A basic approach to dealing with this kind of firmware is to identify some elements or entry points that can leveraged to look for interesting pieces of code.